Atom Earrings under a microscope! 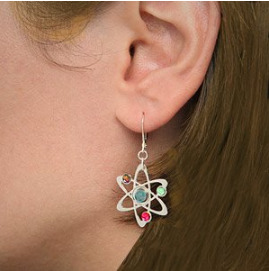 Acknowledge your support of science with our funky atom earrings. They feature a central atom with three orbiting electrons. The atoms are cut from silver plated metal. Each atom measures approximately one square inch. 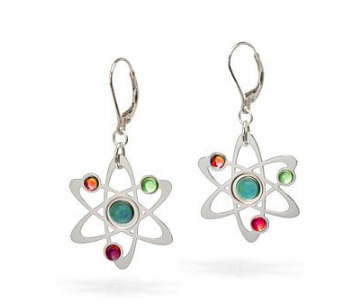 Makes a great gift for someone who is a science enthusiast! It comes packaged in an elegant black glass topped gift box. Atom symbol measures approximately 1.25 inches. Atoms are cut from silver plated metal. Sterling Silver lever back ear wires. 4 lens stones - light turquoise with orbiting electrons in the colors of red, orange, and light green. Packaged in an elegant black glass topped gift box. Each item is packed securely for handling. 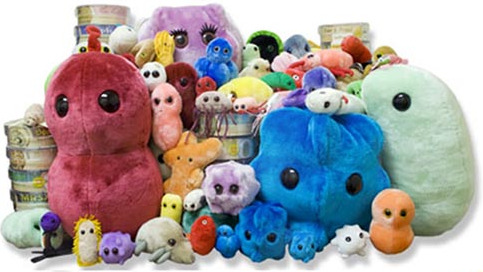 Every product meets or exceeds U.S. and European standards for safety.